Recently one of our customers wanted view more than 250 records in CRM Grid records and currently you can only set up maximum up to 250 only. You can still able to change this in to database directly as mentioned in following steps. Step 1: Get the user Id and then update Paging Limit as mentioned in following screen print. Change the name of your relevant user to get his user record id and then use then in next query to update relevant record. Step 2: Restart CRM web site and also clear user’s IE Cache and done!! 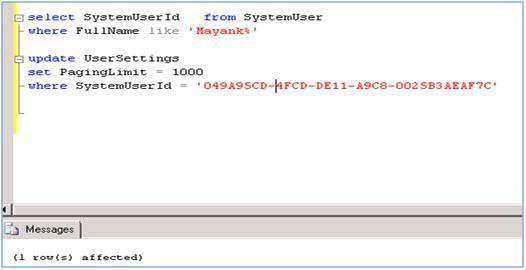 This entry was posted in CRM 4.0, Tips & Tricks and tagged CRM 4.0, CRM Grid, Unsupported on June 30, 2010 by mayankp. This is a pretty cool hack. Its unfortunate that the paging count resets every time the user uses the option dialog. Modifying the ..\Tools\personalsettings\dialogs\personalsettings.aspx to force a size of 1000 doesn’t help either; an internal server validation rejects it [Message: Paging limit over maximum configured value. 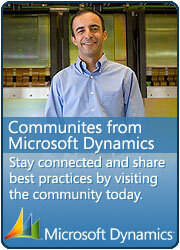 Error Details: Paging limit over maximum configured value.]. It’s similar to SQL, you just have to set the limits properly or include an interface that lets you adjust it.